The Pearl new concert theater at the Palms Hotel Las Vegas real estate opened this past Saturday. The Pearl theater has several tiers of intimate seating in a large crescent shaped room with a large foyer and towering ceilings. On either side of the stage there are nine skyboxes including no obstructed views at the new theater. The venue seems both big and small, and that’s the entire point. 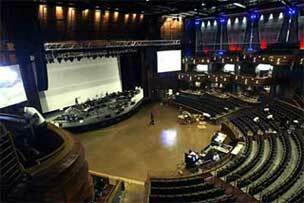 No seat in this new Las Vegas venue is more than 120 feet from the stage. 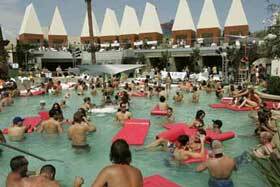 Palms Las Vegas hotel swimming pool $40 million renovation with VIP party July 1 and featured swimsuit beauties. At first glance, the razor-thin bikini strings that strained to hold things together seemed to be the only things working hard around the Palms hotel Las Vegas new pools on Friday afternoon. And no one loved that illusion more than George Maloof, who’s again quietly at work raking in cash while others carelessly frolic around him. The new Palms Las Vegas hotel swimming pool $40 million area is the latest adult attraction at the Palms, the off-Strip resort Maloof’s family opened 4 1/2 years ago on West Flamingo Road near Valley View Boulevard. Palms Hotel Las Vegas real estate is unveiling its $40 million pool renovation on July 1, the weekend for 4th of July in Las Vegas, with a wild party featuring the band Camp Freddy. This weekend will also be the 1st anniversary party of 944 magazine. Dave Navarro, a Camp Freddy member, will also play with his former Jane’s Addiction bandmates in their new band, The Panic Channel. Worship the sun gods at the pool – Palms Hotel Las Vegas opulent outdoor playground featuring, surprisingly enough, two acres of swimming pools. Up to three thousand guests can party in style, enjoying live concerts, DJs and three incredible bars.